The researchers are testing a new design of colonoscope as part of the battle to improve screening for colorectal cancer which, she explains, is the second leading cause of cancer deaths in the Western world. The kibbutz maintains vehemently that the primary purpose of its herd is for medical research, which makes the operation legal. "We work with pigs for the sake of humans," says Ofer Doron, the manager of the institute. He explains that the pig has many physiological similarities to humans, and the Kibbutz's herd is used by companies from around Israel for testing medical devices, drugs and drug delivery systems. However, it also has a factory. 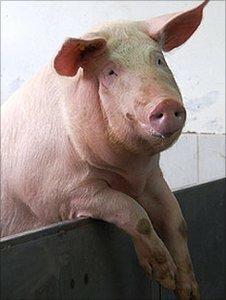 Animals that have been used in research cannot be used for food, but excess pigs, and those raised to provide organs for research, are processed to be sold for meat. 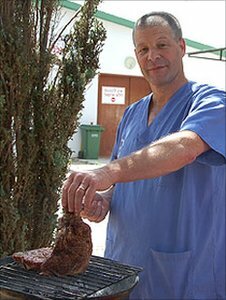 And when the day's medical trial is over, some of the researchers tuck in as Mr Doron doles out plates of sizzling pork chops from a barbecue. Mr Doron is passionately secular and a proud pork eater. A short walk along the kibbutz's leafy paths, Ofer's father, Eri Doron, 78, one of the founders of the collective farm, recalls that the pig-farming began almost by accident. The early kibbutziks were given three pigs as a gift - "from I don't know where" - which they kept in nearby caves. An accomplished musician fluent in English, Hebrew, Italian and Hungarian, he tells me he survived unscathed as a teenager, living in Budapest, as Jews from across Eastern Europe were taken to the Nazi death camps. He was from a religious family, but as a youth would sneak out to restaurants in Hungary to eat pork sausages without his mother's knowledge. His father committed suicide shortly after the war ended, and Mr Doron boarded a ship to begin a new life in the recently-founded state of Israel. 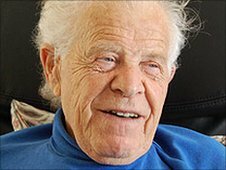 The Kibbutz was strongly socialist, and "very revolutionary", based on utopian Marxist ideals, he says. And there was no debate at all, he stresses, about keeping pigs - "we are atheists," he says simply. Elise Gelkoff, who has lived on the kibbutz for the past 40 years, says secularism in the Kibbutz movement was strongly linked to the post-holocaust mentality. 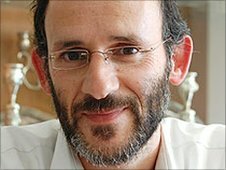 The aim was to create "new Jew". "It was a shared view that we will never be victims again, we will work our own land, we will be strong, we won't take part in the superstitions that comprise religion, we'll see a new clear rationalistic way." But over the years, the Kibbutz's identity has changed. Pork is on the dining room menu less - just Fridays and holidays - these days, as more traditional and religious Jews have moved in. Nevertheless, in Israel as a whole, demand for what is sometimes euphemistically dubbed "white meat" has grown in recent decades. This is partly because of an influx of secular Jewish immigrants from the former Soviet Union, but items such a prosciutto are increasingly making an appearance on trendy Tel Aviv menus. As pork imports are generally banned, most of the meat on sale is domestically produced - with Kibbutz Lahav providing just under a tenth of the total produce. The kibbutz faces strong criticism in a society with a deep-running secular-religious divide. Animal rights activists object to its research and say the pigs' conditions are not good enough, but Ofer Doron says the animals are well looked after and all activities comply with Israeli law. 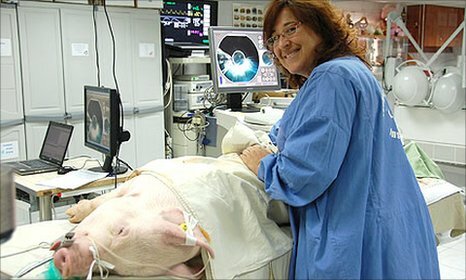 And although many religious Jews accept the use of pigs for medical purposes, they accuse the kibbutz of using the research as little more than an excuse for selling pork for profit. And the aversion to pigs runs deep for some - to the point where swine flu was renamed "Mexican flu" to avoid offence. Rabbi Shlomo Vilk, the leader of a Jerusalem synagogue, says that the pig, even more than other animals considered non-kosher, has become the symbol of everything that for Jews is "unpure, filthy and dirty". As well as the dietary prohibition, he says, the Romans who destroyed the second Jewish temple in AD70 had the pig as their emblem, and as a result, Jewish sages also prohibited raising the animals on the land of Israel. to bring it into the public realm, to say 'this is our flag' and 'this is what we do', yes, I do think it's wrong," he says. "This is disrespect for so many Jews." Even so, he believes that to use pigs for medical purposes is to find, as he puts it, "sparks of divinity" in the prohibited animals. But would he go as far as touching one? There is a long, awkward silence. "Don't push it. I don't know," he says. "In principle - yes. In practice, I don't believe so."